The Bhagavad Gita (Bhagavad Gita;, "Song of God") is one of the most important Hindu scriptures. It is revered as a sacred scripture of Hinduism, and considered as one of the most important philosophical classics of the world. The Bhagavad Gita comprises 700 verses, and is a part of the Mahabharata. The teacher of the Bhagavad Gita is Krishna, who is revered by Hindus as a manifestation of the Lord Himself, and is referred to within as Bhagavan?the divine one. 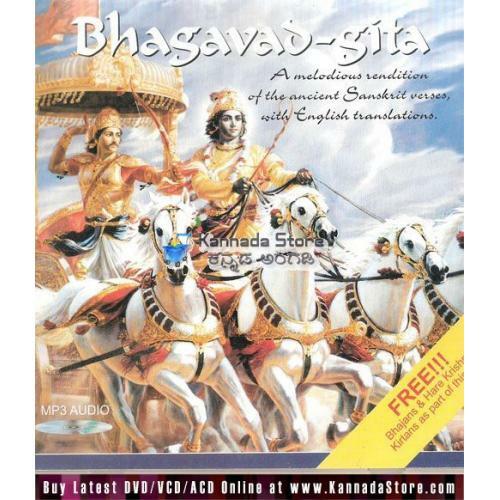 The Bhagavad Gita is commonly referred to as The Gita for short. The content of the Gita is the conversation between Krishna and Arjuna taking place on the battlefield before the start of the Kurukshetra war. Responding to Arjuna's confusion and moral dilemma, Krishna explains to Arjuna his duties as a warrior and prince and elaborates on different Yogic and Vedantic philosophies, with examples and analogies. This has led to the Gita often being described as a concise guide to Hindu philosophy and also as a practical, self-contained guide to life. Maharishi Mahesh Yogi describes it as a lighthouse of eternal wisdom that has the ability to inspire any man or woman to supreme accomplishment and enlightenment. During the discourse, Krishna reveals his identity as the Supreme Being Himself (Svayam bhagavan), blessing Arjuna with an awe-inspiring vision of his divine universal form. The Bhagavad Gita is also called Gītopanisad, implying its having the status of an Upanishad, i.e. a Vedantic scripture. Since the Gita is drawn from the Mahabharata, it is classified as a Smṛti text. However, those branches of Hinduism that give it the status of an Upanishad also consider it a śruti or "revealed" text. As it is taken to represent a summary of the Upanishadic teachings, it is also called "the Upanishad of the Upanishads"
A Melodious rendition of the ancient Sanskrit verses, With English Translations.